They say, “30 minutes are all you need to get your money’s worth of drinking,” when you ride the High Roller Happy Hour Pod at LINQ Las Vegas. Aboard the world's tallest observation wheel, you'll be soaring 550 feet above the Las Vegas Strip. This wheel and the 28 huge cabins, or pods, take 30 minutes to complete a revolution. Party on in an open bar cabin with a bartender. A "Happy Half Hour" ticket, available from 12 p.m. —1 a.m. for those 21 and over is a great deal. The High Roller Happy Half Hour at the LINQ gives you two great deals in one. You set off on a ride on the large observation wheel that dominates the Las Vegas skyline to enjoy the view and you get a great deal on adult beverages. 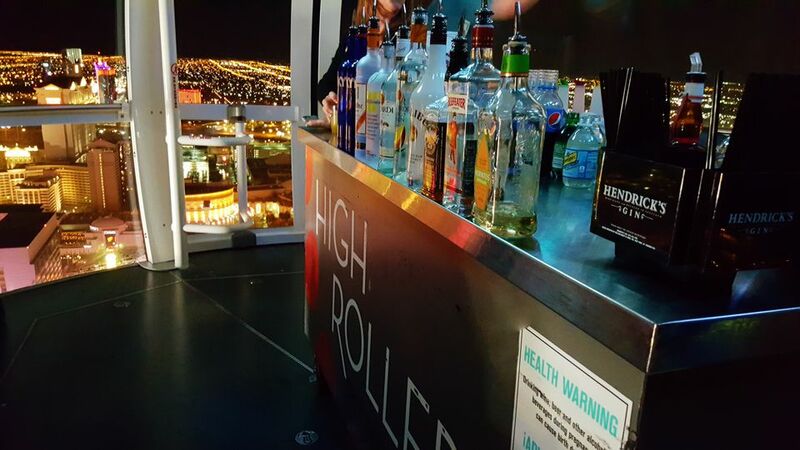 Yes, they do have soft drinks but it's not recommended that you get on the High Roller pod with bar service just to have unlimited servings of your favorite soft drinks. It will no longer become a deal. While your half hour ride in the bar cabin is a good deal, people are taking advantage of Internet deals for the cost of the ticket. Groupon and Travelzoo seem to be good bets for finding discount tickets. The bartender can make most well drinks but the complicated cocktails of the fancy bar scene are absent from the High Roller Happy Half Hour. It’s understandable as there is only so much room for the cocktail cart for ingredients, liquor, mixers, and beers. But the drinks are strong. Many like getting a drink that is predominately alcohol sans the fancy stuff. The bartender will serve you a very stiff drink if that is what you desire. Bartenders will tell you that if you want an impressive cocktail to feel free to stop by the bar at the base of the giant observation wheel. The bartenders on the High Roller Happy Half Hour take shifts and they are mixing drinks in the bar for a portion of their shifts and then mixing them on the wheel for the other part of their shift. So, yes you get real bartenders who can put together a great cocktail if given the right ingredients. This might be the best deal on drinks in Las Vegas. However, you do have to be a speed drinker. Beers are available and the weekday crowds on the pods with cocktail carts are sparse so the bartender spends a lot of time waiting for you to finish a drink as opposed to you waiting to get your fill. The experience lasts 30 minutes and it really is an open bar. Happy Half Hour cabins roll daily from noon to 1 a.m. You must be 21 or older to ride in a Happy Half Hour cabin. Discounts are offered to Nevada residents, the military, students and seniors. If you are looking for more places for a drink in Las Vegas, 77 Places To Find A Party In Las Vegas is right up your alley. What Is the Best Cocktail to Order at the Cosmopolitan Las Vegas?